Lake Harmony PA ~ Summer Watersports, Here I Come! Originally known as Big Pond, Lake Harmony is a natural glacial lake with a dam. The two and a half mile long lake ( Approximately 125 acres) is privately owned by Lake Harmony Estates. Unlike Big Boulder Lake, power boats are allowed on Lake Harmony with plenty of boating, water skiing, and jet skiing. Lake Harmony Estates has a boat dock and marina. There are tennis courts, beaches, and designated swimming areas. Although access to Lake Harmony is only through the Estates, there are plenty of short-term vacation rentals. Accommodations in the area range from condos to townhomes and single family houses. The area in and around Lake Harmony, mainly speaking Split Rock, which shares the Lake with the Estates, is host to numerous events each year. Events such as The Wine Festival, Beer Festival (do you see a pattern here), Celtic Festival and more help round out this cozy area of the Pocono Mountains! If this sounds like a place you might want to take a look at for that prestigious Second home or possibly even to live year round then I encourage you to Start Your Search for that Dream Pocono Home RIGHT HERE now for FREE! 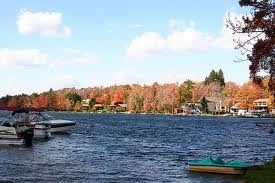 Pocono "Lake Communities" From A to Z ~ An Ongoing Online Tribute to the Lake Communities Here in The Poconos ~ Blog Style! First up on the list would be considered by many to be the Biggest and Best of the Pocono "Lake Communities". You've Heard the Term "Bang for The Buck"! Well This Term Fits The Arrowhead Lakes Community Like a Snuggie, Warm, Soft and Totally Wrapping You Up and Making you FEEL GOOD! With 3 Heated Swimming Pools, 4 Beaches Spread out across 360 Acres of Lakes, Tennis Courts, Basketball, BBQ Facilities and Childrens Playgrounds at ALL Pools and Beaches, Brand New Lodge (Set to Open in 2011), Clubhouse, Sledding/Tubing Hill, Community Entrance to PA Gamelands and MORE, this community stands out among others. Did I mention CURB SIDE Trash Pickup? How About 24 Hr/ 7 Day a week Gated Security? This Community Pretty Much Has it ALL! Looking for a Home Under 100k? You have a Decent Shot in Arrowhead Lakes! Check out ALL Arrowhead Lakes Homes for Sale HERE! Imagine Walking out your Back Door and Jumping Right into your boat that is corralled right to your own Dock! An Arrowhead Lakefront Home will Offer That to You! View All Of Arrowhead Lakes' Lakefront Homes for Sale HERE!